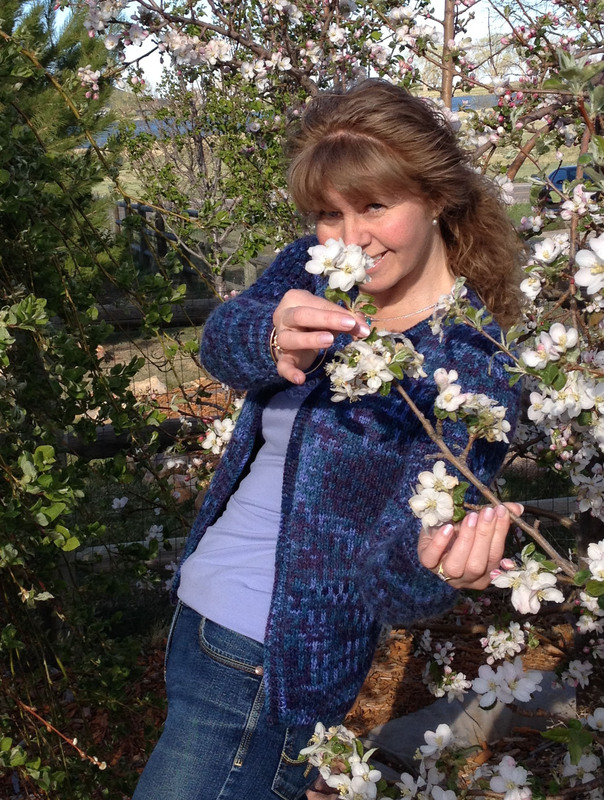 I do love cardigan’s and I am so pleased with my Kandinsky cardigan knitted using Rowan Fine Art Aran. It feels so incredible soft next to my skin and I know it will be nice and warm too! 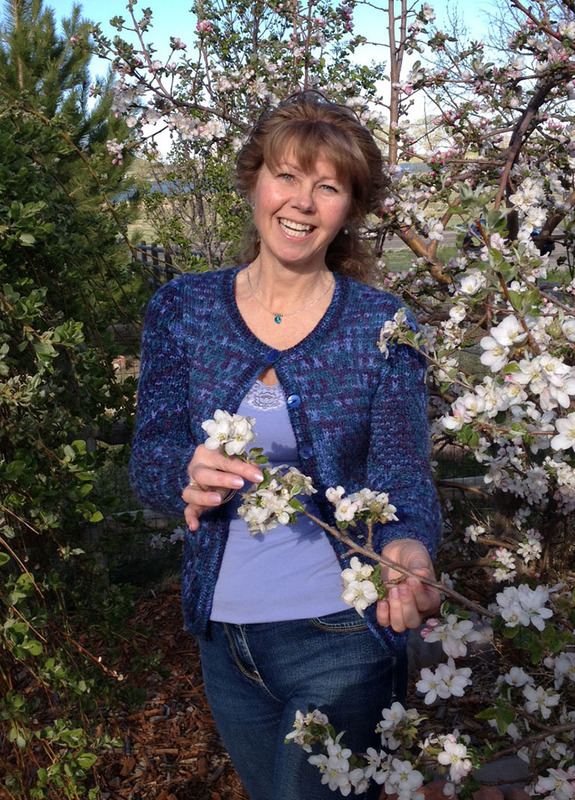 However, if it gets too warm I can just unbutton it……..that’s why I love cardigans! The reason Fine Art Aran is so soft, cuddly and warm is because it’s a luxurious blend of merino wool, kid mohair, alpaca and mulberry silk. The actual fibre content is wool: 50%, mohair: 20%, silk: 5%, alpaca: 25%. The unique colour effect is achieved by hand painting the yarn with different colours just like Rowan Fine Art, specially designed for socks, shawls and other accessories. 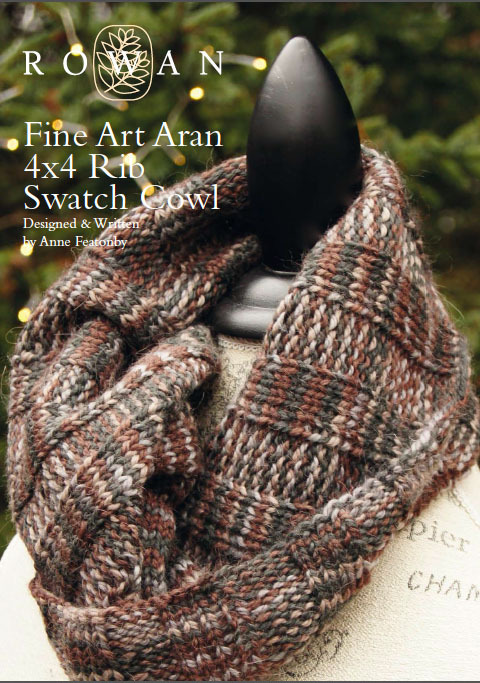 Fine Art Aran comes in 8 different shades……………. 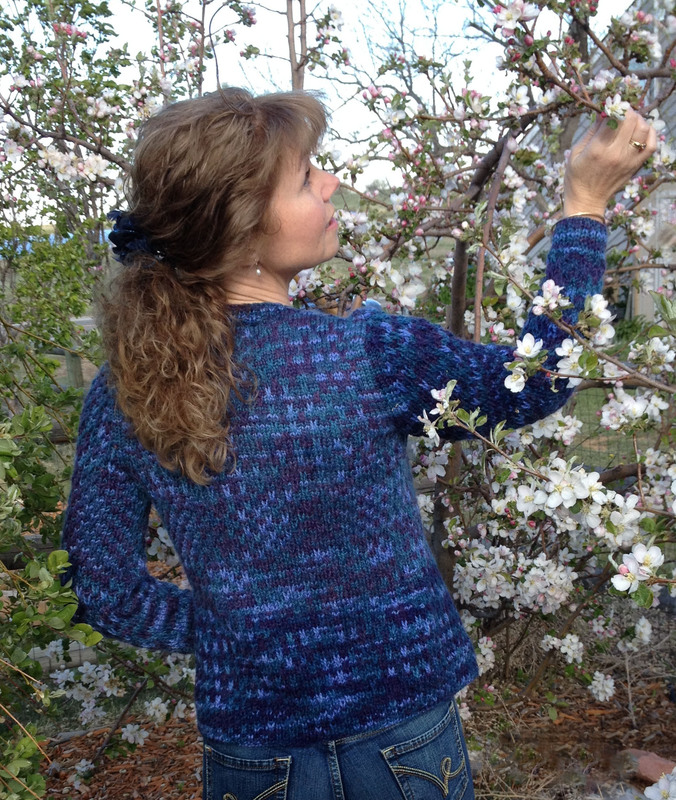 but I chose Flamenco (549), a lovely blue/purple/green mix for my cardigan………. As you knit up Fine Art Aran it produces a stripey coloured effect, as shown above, which I have seen on lots of knitwear in the shops recently. However, I wanted to interfere with this effect so I used a slip stitch amongst the regular stocking stitch to scramble the striped coloured effect and give the knitted fabric more texture………. To produce this effect, pictured above, I wrapped the yarn twice around the needle on every 4th stitch and slipped this stitch for the next 3 rows. On the 5th row I wrapped the yarn twice around the needle on every 2nd stitch and slipped this stitch for the next 3 rows. Then I repeated these 8 rows over and over again. 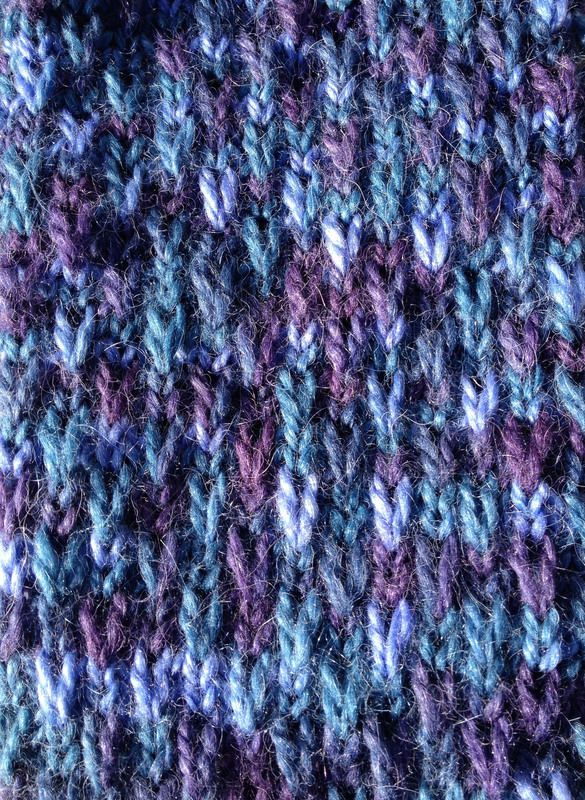 I used stocking stitch as the basis for the slip stitch pattern and 4½mm (US 7) knitting needles. If you do decide to do this slip stitch please check your tension beforehand. You may also need to buy an extra ball of yarn just in case you need it as this stitch can make the width of the knitted fabric slightly smaller. However, you can knit this cardigan in regular stocking stitch as per the instructions given for the pattern and produce a lovely self striping coloured garment! Kandinsky can actually be knitted up as a sweater as well as a cardigan; its simple ribbed edgings and stocking stitch make it ideal for the beginner knitter. 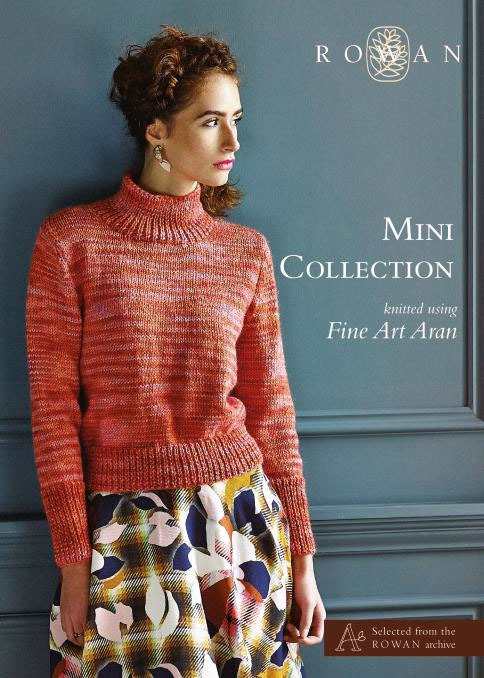 Here is the sweater version, pictured below, on the front of the Fine Art Aran Mini Collection, shown knitted in the shade Azonto (552). This collection includes 8 easy to wear designs taken from the Rowan archive, originally designed by Kim Hargreaves and Martin Storey. There’s definitely something for everyone in this collection ranging from a simple slouchy hat (Turner) to oversized collared jacket (Vangogh). 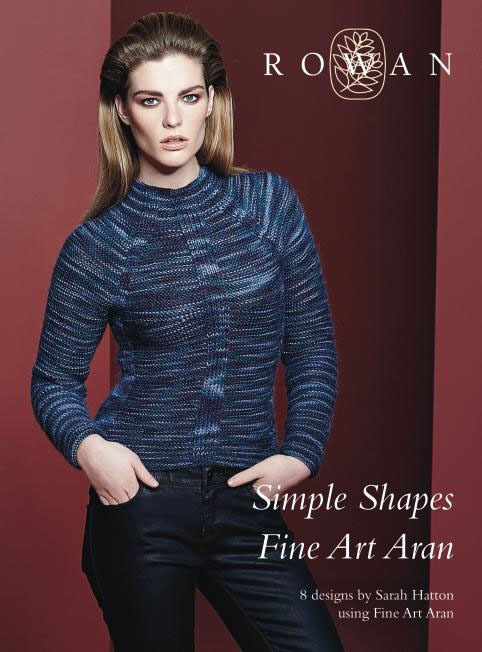 Rowan have released another set of patterns that use this beautiful yarn: Simple Shapes Fine Art Aran. 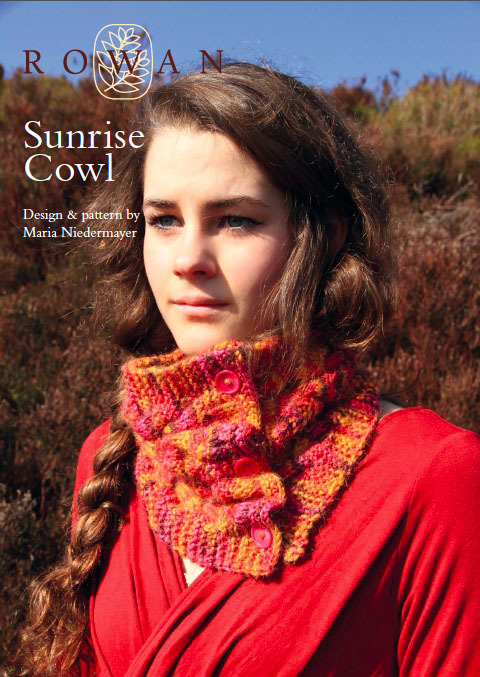 Rowan also have an online collection of 4 cowls designed by two of my Rowan Ambassador colleagues Anne Featonby and Maria Niedermayr, using Fine Art Aran. You just need one ball for each of these projects and the designs are all free to download for Row@n Members. It is still sunny and warm here in Colorado……another near 90 degree F beautiful blue sky day today…..but I can’t wait to wear my cuddly Kandinsky cardigan! If you have knitted something using Fine Art Aran please do let me know by leaving a comment or why not post a picture on my ‘What Colours Make’ Facebook page……I would love to see it!